As families across the nation are heading back to school, Mom's busy schedules are filling up quickly. PTA meetings, volunteering at school, shuttling the kids to and from sport practices and activities all add heavily to Mom's day. Finding a way to carve quality family time out of the schedule can be a challenge. Even so, taking time out for family fun is important, whether for a last run to the beach, a family date night, exploring a local trail or a visit to the zoo and aquarium! The challenge facing Moms is how to find that extra time! The makers of all® mighty pacs™ designed this handy new laundry detergent solution especially with Mom's precious time in mind. These handy pre-measured packs are just the right size for your average laundry load and contain powerful stain-lifters to save Moms the time of pre-treating and battling with their family's stained laundry. Safe to use in all types of washers, simply pop one all® mighty pac™ in with your laundry for average loads, or two pacs for larger or heavily stained loads. How convenient is that! With a family full of stain-makers, this Mom loves the convenience of detergent and stain-lifters concentrated into one easy pac! Even better, all® offers these mighty pacs ™ in a free and clear formula that is free of dyes and perfumes, perfect for my son's extra sensitive skin! To help Moms celebrate the freedom from extra effort in the laundry and the importance of family time, all® has partnered with ParentsConnect.com to offer the Mighty Fun, Mighty Moments contest! The Grand Prize winner will be treated to a well-packed family vacation on Norwegian Cruise Lines for a seven day Nickelodeon themed adventure! How much fun would that be! Don't miss your chance to enter! The Mighty Fun, Mighty Moments contest ends at 11:59pm EST on Thursday, August 23, 2012! Check out the Mighty Fun, Mighty Moments Contest and enter! This Mom had a chance to try all® mighty pacs™ and I loved the convenience. Never at a shortage of heavily soiled clothing from my in-house athletes to test, I personally found the stain-lifter to be quite effective. Best yet, my son loved the pacs and this Mom didn't miss a beat! I took advantage of his appreciation for the fun pacs to teach him how to run simple laundry loads! Score one for Mom! 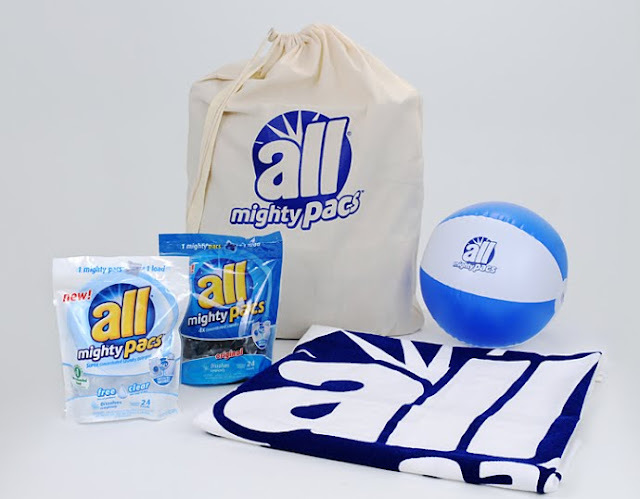 all® is generously offering That's What She Said readers an opportunity to win a fun all® mighty pac™ prize pack for themselves and save their own precious time! This giveaway is open to residents of US, 18+ and will end on Wednesday, September 5, 2012 at 12:01am EST. Winner will be selected randomly from all eligible entries and notified by email. Winner must respond within 48 hours or another winner will be randomly selected. Please leave email address in your comment if it is not available via your comment name. Tell me in a comment below how you would celebrate extra time with your family! Disclosure: The information, products and additional all mighty pacs gift pack was provided by all® through MyBlogSpark. The opinions above are both honest and of my own experiences. Images sourced from various all® websites. Sponsor is responsible for supplying and shipping prize. Facebook, Pinterest and Google+ are not involved in nor responsible for this giveaway in any fashion. take them to the park!! One of the things we love most is the beach. Not many of those in AR, though. If we had the time and the money we would definitely have a beach vacation. One of my favorite time saving tips is to have lunches ready to go the night before. Saves a ton of time in the morning talking about it and then having to prepare it. Preparing lunches ahead of time. i'd love to spend more time with my family doing fun things, like going to the beach or park, visiting children's museums, and reading together at the library! By going out to eat! I would watch a movie with them. I would celebrate extra time with my family by going on a bike ride. I would go for walks with my son. I would go to the park and have a picnic. I would love to take my family to the zoo. Your picture at the top of this page inspired me. We haven't been in years, since we moved away. Thanks for the chance! I'd love to go to a theme park. I would celebrate more time with my family by taking a long walk with them! We would probably play a board game and relax! We would use the extra time to have a picnic. We would spend time shopping, taking walks, going to the park or maybe even taking a weekend trip. More time at the park with my family, playing in the splash fountains! I would celebrate extra time by baking cookies together. I like All on facebook as Susan Chester. I follow you on twitter-ptowngirl25. I would celebrate extra time with my family by taking a road trip. I'd have more time to play with my kids. We would go to the park. We'd have more time to go hiking! I would watch a movie with my family or play more games together! Sit on the porch with the hubby and relax for a change. i would use that extra time to go to the park and have a picnic. We like to bbq out by the pool. Thanks for the giveaway. I would watch movies with them! I'd play in the backyard with my kids! I would take them to some local museums. I would spend more time with my family playing fun games. I would read my daughter some extra books with the time and play outside with all my children. I like All on Facebook user Lisa Garner. I like That's What She Said on Facebook user Lisa Garner. I'm following That's What She Said on Twitter @lisalmg. I tip for Mommy time saving is before i go to bed i plan her meals for the next day and I have her get them her self from the fridge...it helps a lot! Also entered Surviving Back to School Shopping! I would love to be outside with my family in this fall weather. Right now, extra time would be spent putting together a family picture collage. Id take the kids to the park! I like all on fb under rab pom. I like TSUE on fb under Rab Pom. I'd go shopping with my family. we would play monopoly and have pizza to celebrate extra time with family! I would read to my little grandson more. I 'like' All on Facebook. I 'like' That's What She Said on facebook. I would celebrate by doing something special. Nothing big but special. We would go to the movies. I like tThat's What She Said on Facebook. go to Charleroi and check things out! I would have a family movie night!! We would celebrate by going to the movies. Thanks for the giveaway...play volleyball with my daughters ! We would definitely talk more.